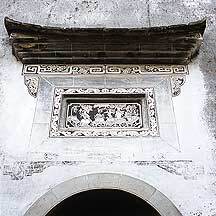 关麓Guanlu is located on the foothills of 西武岭Xiwuling. Because Xiwuling had be called西武岭雄关Xiwuling Guan (Xiwuling pass) and because the village is on its east foot (麓lu,) hence its name 关麓Guanlu. 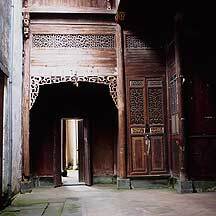 Like 西递Xidi, 宏村Hongcun and 南屏Nanping of the same county, Guanlu is known for its centuries old village architectures. 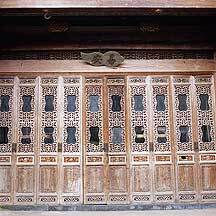 Its well-known "eight family houses" were built during the 清朝Qing dynasty (1644-1911) by eight Hui merchant brothers of the same 汪Wang clan. 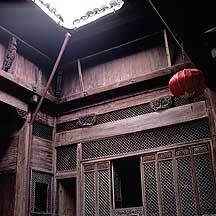 What is unusual about these eight large houses are its physical connection. 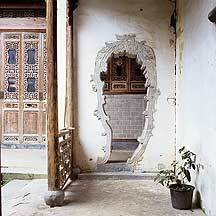 Each building has its living rooms, garden, and courtyard; but each also has a doored hallway that connects through the next building, forming a single structure. 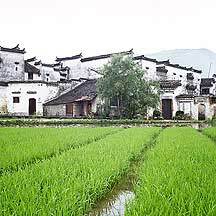 Guanlu is the latest in the list of well-known villages of 黟县Yixian county to be promoted as a tourist site. Mr. Ye of Nanping informed me that Guanlu has about 100 households with a population of about 400. And it has been open to public for 2-3 years, since 2003. 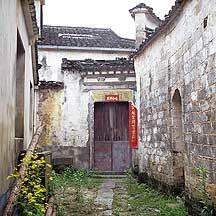 Prior to my arrival at Nanping I did not know the existence of this village; but when my bus stopped at the entrance road to Nanping I noticed a wall sign with the Guanlu's name and an arrow pointing west 3km. 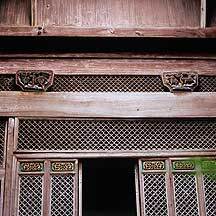 Later I asked Mr. Ye, and he said Guanlu is well-known for its eight linked houses and is worth a visit. So I went. The small village had 3 guides. I went in and my beautiful guide took me around carrying a ring of keys. At each building she had to unlock the door, then relock it when we were done. Some of the 8 buildings were desperately in need of repair, so we cannot go in those; but the ones I did get to see were a discovery. It is akin to uncovering a cave and seeing what is inside for the first time. The gold painted carvings in the room literally glows. They are amazingly well-preserved. Unfortunately, I could not take any photos of the interior due to the low lights and its inaccessibility. One thing I appreciated here was the total absence of tourists or students, unlike the previous three villages whose numbers of sightseers were at the critical level of infection. While I was roaming the empty village, I met two advance photography students who came here prepared with high-end large format cameras, Hasselblads and the latest professional digital 35mm cameras, lights and reflectors, and large tripods and stands. 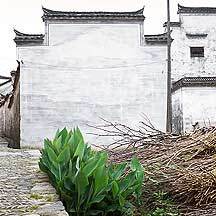 This small quiet village will be their playing field for the week, where their passion will drive them to preserve the village through their images before the onslaught of tourists that had consumed the likes of Xidi and Hongcun. Their professor back	back in 杭州市Hangzhou city recommended that they consider this village as their project. When I spoke with them, I sensed their deep frustration at what they see as people's total ignorance of cultural heritage and its irreplaceable value. 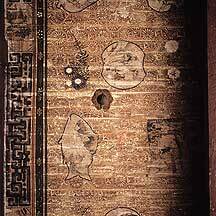 They were upset at the disrepair of the buildings and the displacement of money for its restoration and protection. Although there were widespread sabotage several decades ago, there is none of these wildness today. 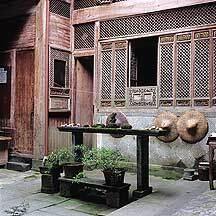 What there is, however, is a rush to set up areas (any area that have a hint of historical value or uniqueness) as tourist spots. 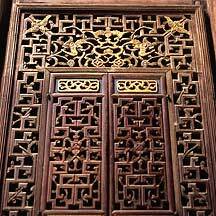 Consequently, for those who cares, a distinctive sloppiness can be found in the restorations of original works and a low quality workmanship in reconstructions and other accessories. This is merely my general observation and is not true in all areas. 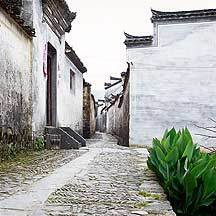 For example, these villages are well-preserved and authentic, but I find the atmosphere unnatural. I also find the Great Wall to be authentic even if sloppily restored (the Great Wall probably bankrupted the Ming empire, it will very likely bankrupt today's government to rebuild it, or restore much of it), because the Wall is more a piece of engineering and military design than any fine architecture. 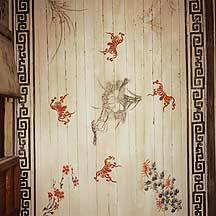 And its aura depends much on its concept, history, myths and legends, magnitude and other intangibles. Although sabotage and negligence is a concern, I find the promotion of these places as a "living museum" more troubling. "Living museum" is a oxymoron. By promoting it as a museum, one automatically set it aside as dead history. Thus, people come here to see the wonderful buildings and people from the past. 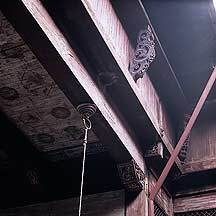 And the tour guides hold up their speakers while blasting about the history of this and that, and how people had lived like this for 400 years. Things are taken out of context and history is entertainment; you hear people come and go, talking about the great white walls. We ought to treat these areas as logical consequences of its local cultures and landscape. It survival as such has its own reason and not because it has historical value. It lives in the present and ought not to be alienated by popular promotions. Instead, the general well-being of the area should be reinvigorated so that there will be people at home to take care of things, otherwise termites will do the job. I am in the line of thinking that things ought to come and go naturally. There is a lifespan to everything. One should not fool oneself into thinking that one does this and that for anything's own good. I rather witness all these historical monuments deteriorate and crumble naturally than to see them as useless, untouchable dead museum objects that is taken out of context and cannot relate to the living. There is no need to keep everything nor is it possible. Nor is the selection process always fair. What people should concern, however, is not the site itself but what cause us to think about that site. Is it in our time that we cannot duplicate or improve on the past that we find ourself feeling wonderful walking down the narrow lanes, something that we cannot find in our own streets? But I was delighted at my decision to come here. It is small village but feels like a magic box that have endless variations. I will surely come back again. 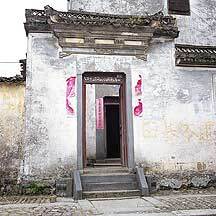 关麓Guanlu is in 黄山市Huangshan city's 黟县Yixian (Yi county), so one usually get a ride from there to the village. 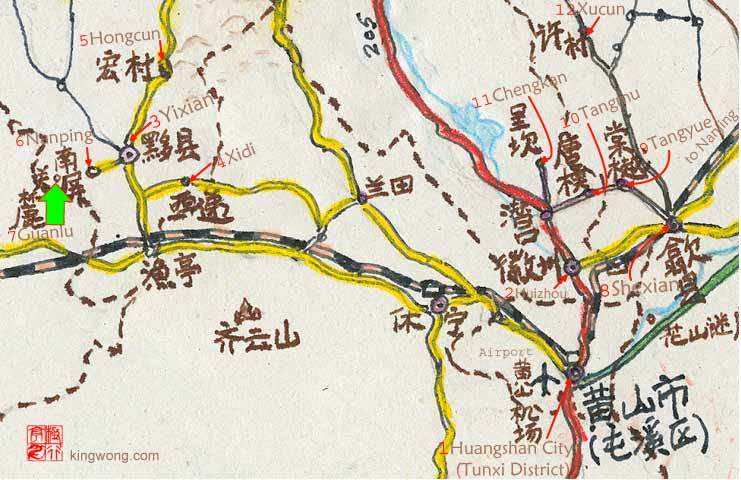 There are buses to both 黟县Yixian (Y9 and takes about 45mins - 60mins in 2006) and 歙县Shexian (Y5 and takes about 30mins in 2006) counties from outside 屯溪>Tunxi'smap. From Yixian, there are public buses(Y2 - Y3 and takes about 30mins in 2006) to the villages, whicn includes 西递Xidi, 宏村Hongcun, 南屏Nanping and 关麓Guanlu. To get to Guanlu, you will pass Nanping on your way. So mind as well visit both villages. At the time I was here, the road to Nanping was under construction (summer 2006), so it took longer than normal to get there. But the road from Nanping to Guanlu was a smooth paved 3 km road. The public buses normally waits from across a short stone bridge not far from the bus station. Signboards with the name of the villages are usually placed on the driver's front window; if not, confirm with the driver that it is going to your village. If you are in a hurry and there is no public buses there are always plenty of minivans for hire that will take you there(about Y15). Other alternatives are to hire a van in Tunxi and go straight to the village. This may cost alot more(probably about Y100), but if you have several people this may be much faster and easier. Family-style guesthouses are what you will get here. 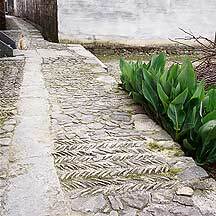 It is a very small village (about 400 people) and had opened for tourists only a few years, so there are no hotels. But anyone will be very happy to take you into their homes for the night for a very small service fee (Y20 and up). As there were also no real resturant, the family will cook you food as well. Most visitors came around for a short look and leave, but if you like the peace (no tourists -- not yet, but better hurry) and no-frill accomodations, it would be an experience to remember. 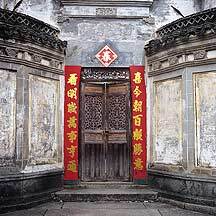 An alternative would be to stay in Nanping village, which is much easier to stay and eat, and visit Guanlu in the day. 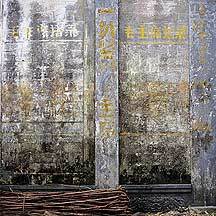 Foreigners, or at least non-Chinese, need to get a permit to see these places. The permit can be obtain from Tunxi's PSB. As I have never looked at one, I don't know what is involve. Inevitably, there is a fee, which I had read to be about 60 yuan. Just be sure that the permit has the places listed on the permit. 25 Yuan. Includes a guide, who has the keys to the important buildings.